No top coat on these! For one I wanted to see if Frizz Spots was annoyingly gritty. While I do have some texture from the glitter it is not bothering me, and the polish has a wonderful high-gloss shine all on it's own. I'm really happy with Nyx Girls Frizz Spots - the silver glitter shows through the dark grey/black jelly base and reflects all the colors of the rainbow. I think you'd consider it scattered holographic glitter? 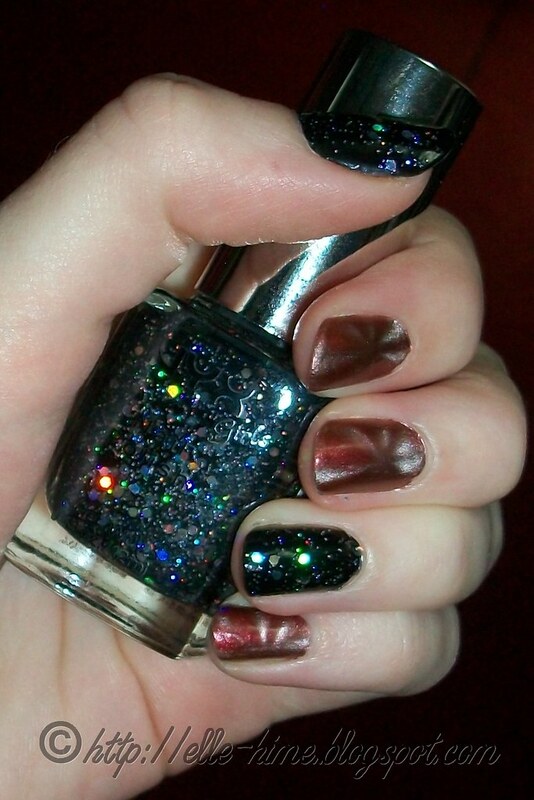 The glitter isn't super dense but distributes well over the nail; at two coats I feel it is just right. And there were no problems with the glitter being dragged to the end of my nail! One thing to note is that Frizz Spots definitely benefits from having a base color on your nail to reach opacity, but don't think that is has to be black. It would look great over any and all dark colors, I'm sure. Copper Seduction would be more awesome if it were a rich deep red, but then I guess it would not be called copper, would it? 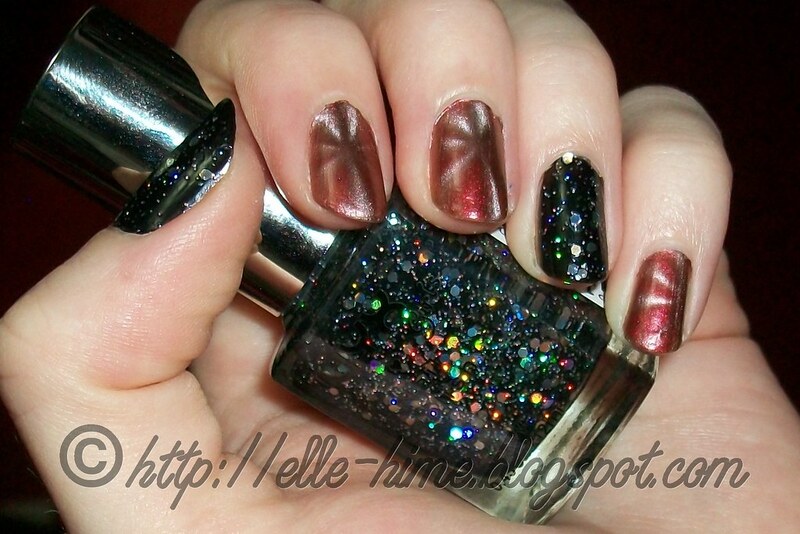 I would describe the way it looks on the nails as being an antiqued red. Not my favorite and I don't think I'll rebuy it but it is wearable. I wouldn't go for a color like this on it's own but the silver iron particles save it for me. 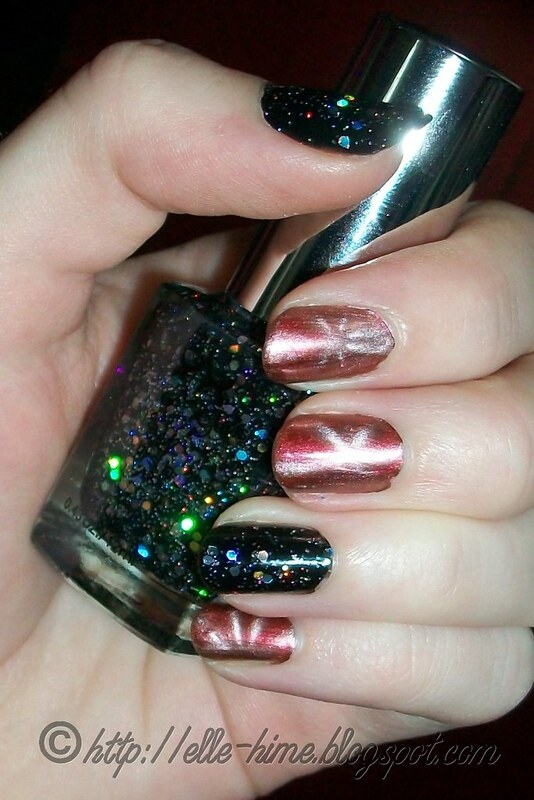 I know I've said it before, but it's so fun to move your hands at different angles and watch the magnet-created pattern "move" in the polish! Though my designs are not aligned perfectly I did a lot better this time. Maybe because 6 nails is less pressure than getting 10 right, but I'd like to think that I'm improving, haha. 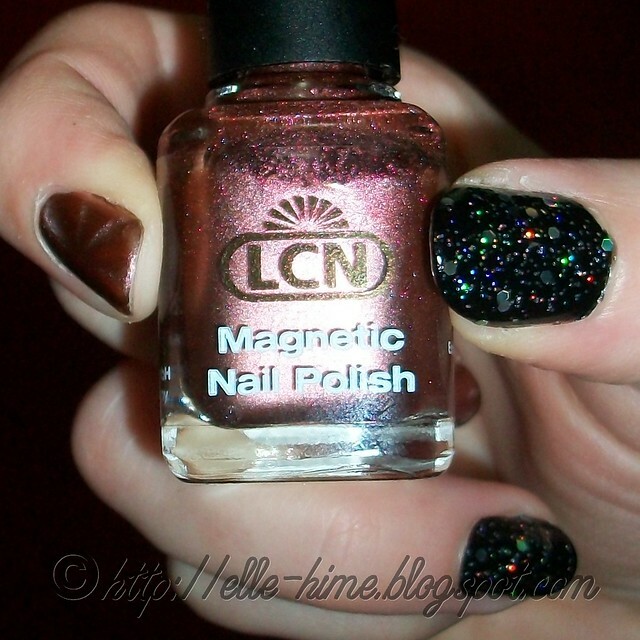 On a sad note I clumsily chipped a nail with the LCN polish on it. It wasn't the fault of the polish, it was that my nail itself chipped. Argh, so frustrating! I don't want to redo my nails yet, though. To wrap things up, I highly recommend Frizz Spots - I'm enjoying it more than anticipated. 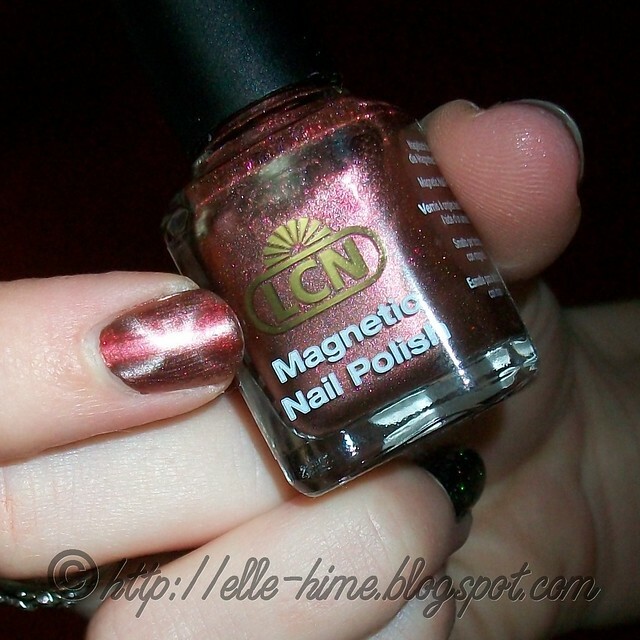 I'm also happy to try another magnetic color, my guy smiled when he saw it on me, and I hope you did too! 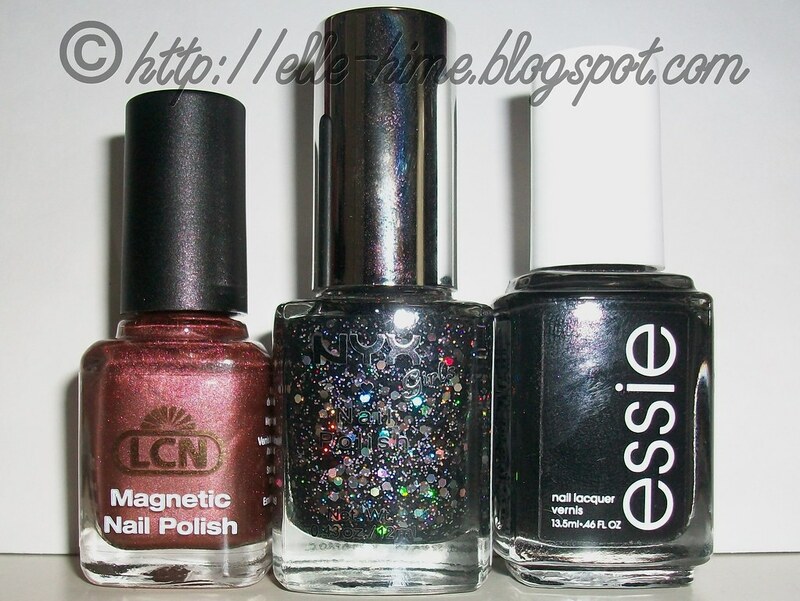 Love the LCN and the NYX polishes on you! Gorgeous!! !